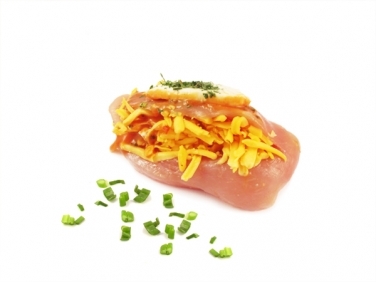 We have prepared these Chicken Italiano to make it quick and easy for you to serve. Fillets of Chicken stuffed with cheddar cheese, sundried tomato & marinated in Italian garlic & herb sauce & topped with mozzarella. Cook this scrumptious chicken in the oven and enjoy with family and friends. I think this dish--which my family loves--tastes wonderful because there are so many flavors going on. It looks beautiful too, topped with the bright red tomato and the green oregano, so it's a great dish to take somewhere.